that contain extremely rare or previously unheard/unseen material. the events centred around the "Mind Games" album. Plus the beginning of John's 18-month lost weekend in Los Angeles. It contains a DVD of press conferences, public appearances, promotional videos, TV adverts, Television appearances and outtakes. substantially upgraded quality and for the first time in true stereo. The 24 page stiff card booklet for the TMOQ Gazette has a much more detailed write-up from which the above was extracted. It also has a more detailed page about the the DVD and one of the C.D. 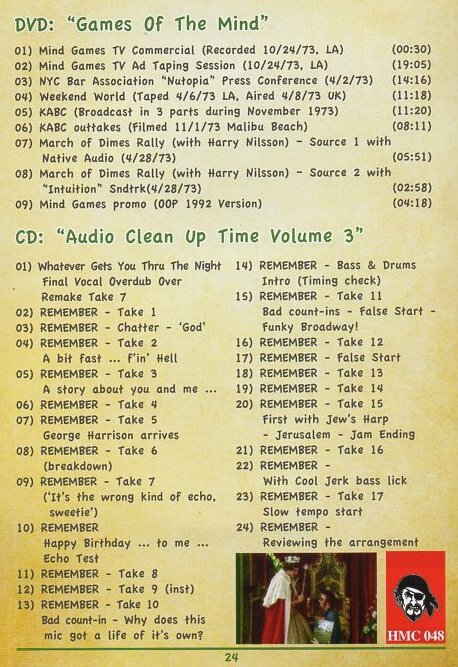 The bulk of the booklet is taken up with an allegedly unpublished interview with John from early spring of 1975. My copy has page 24 (the back cover) printed exactly like on the back where page 20 should be, and I have no page 22 ? 2 Mind Games TV Commercial Taping Session Recorded 24/10/1973 in L.A.
About eight minutes of take after take of a fake Queen holding John's album. Then John appears (although not in the finished version) horsing about with "the queen". 5 John Interviewed Recorded 1st November 1973 walking along Malibu Beach. Broadcast in three parts, all of which are included here. 6 KABC Interview Outtakes Recorded 1st November 1973 walking along Malibu Beach. "Audio Clean Up Time Volume 3"
A brief faster version as they try to work out the correct tempo. "It's getting a bit fast ... effin hell"
At start, "Here's a story about you and me, and me and you .... "
Slower than previous take ... too slow. John at start, "Put them louder in the ears, I want to hear the boomp boomp"
John at start: "Everything sounds a little better"
"1,2,3" ... John, "What ? .. you gave us 4 last time"
Jam ending - John starts singing at 6:15, "She was rolling and polling .... ". At start, "Limit the piano and let's hear it in the ears"